When I was visiting Play Party Pin, very frankly, I didn’t read in detail. Looking at the title, I thought it was spaghetti cooked with a type of squash. When I scrolled down her post, I started to see the picture of a big melon and Ms. Britni Vigil was using a fork to take out the flesh. I was shocked as the way she prepared this melon looked really familiar to me. 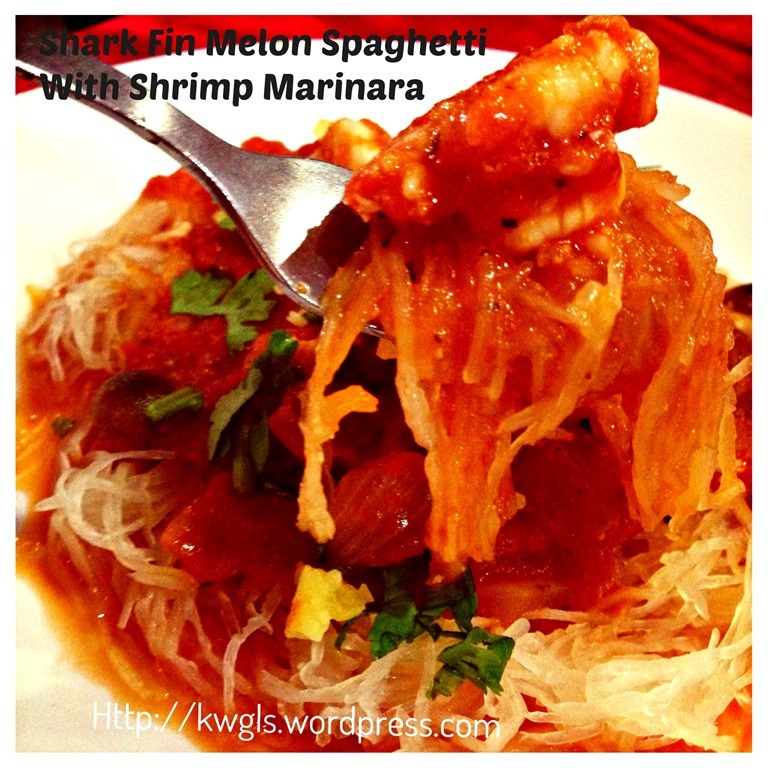 It was just like the way my mother in law prepared the shark fin melon. 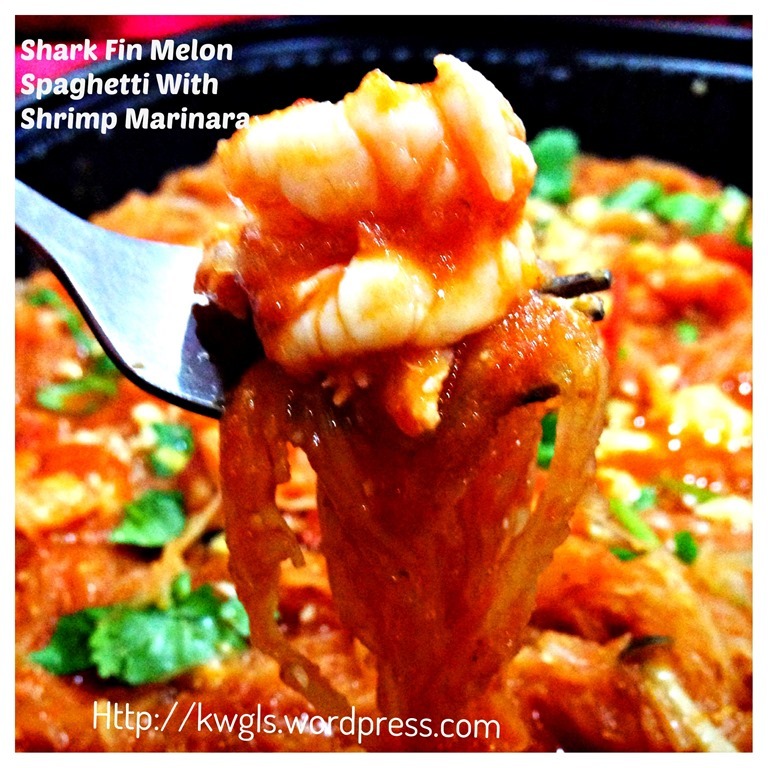 I read in detail and I noted though the colour of the skin is different, I am rather sure shark fin melon can be used for the dish too. 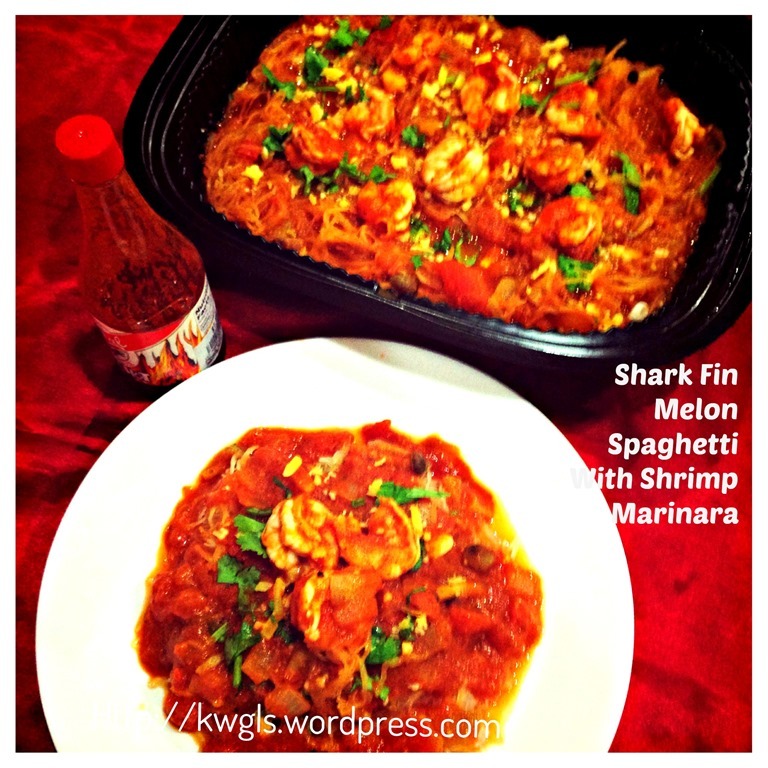 On the next trip to the market, I purposely went to look for a whole shark fin melon and I used her way to prepare this dish on the next day. As for the sauce, since I did not know what Pesto sauce was, I have resorted to the use of marinara sauce with shrimps. 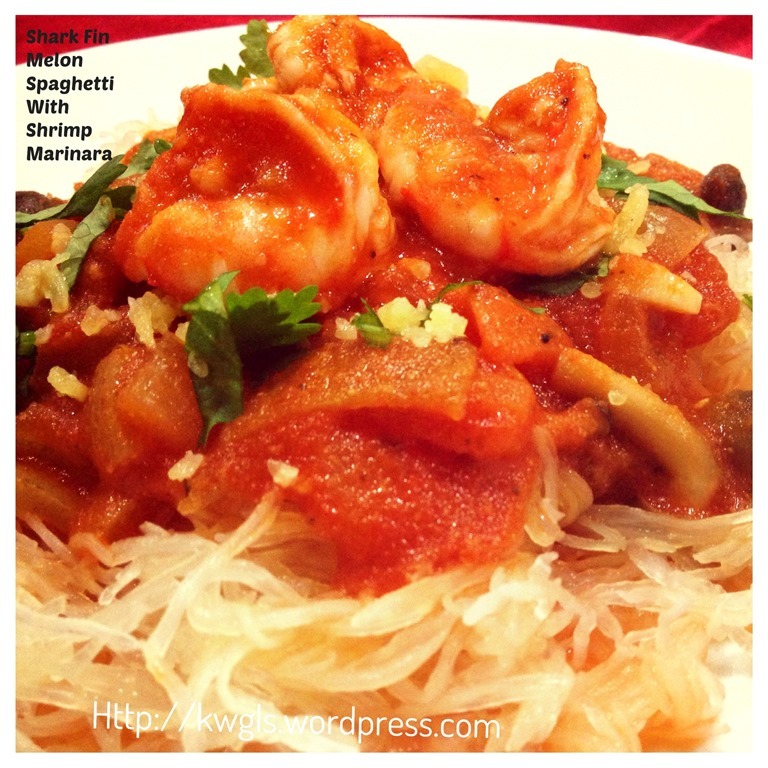 I have never had any spaghetti that have shrimps in it. 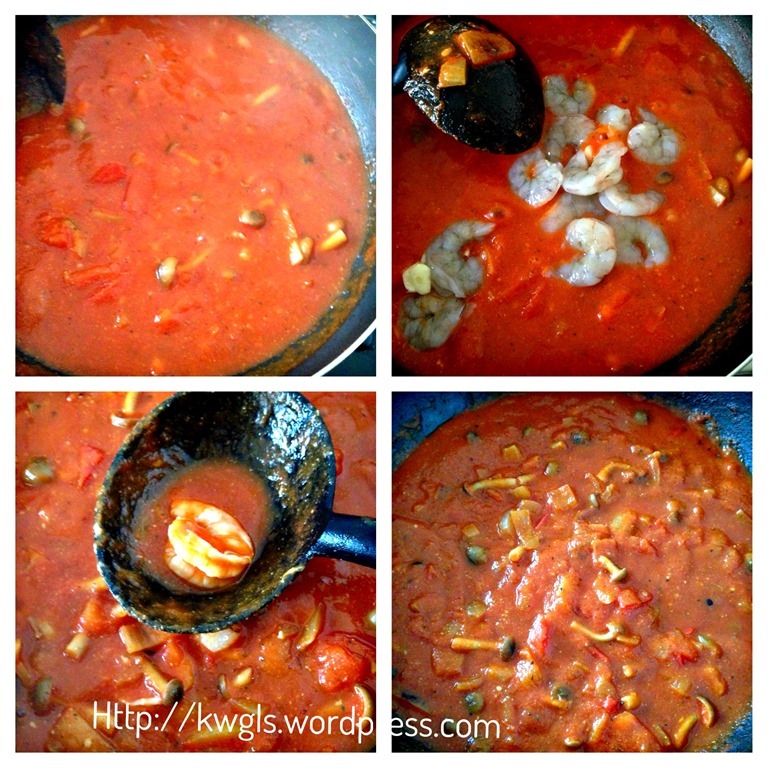 I thought it might be a good idea to give it a try when I saw Le Monine Family Kitchen posted her Easy Shrimp Marinara in my Food Bloggers and Foodies United Group. 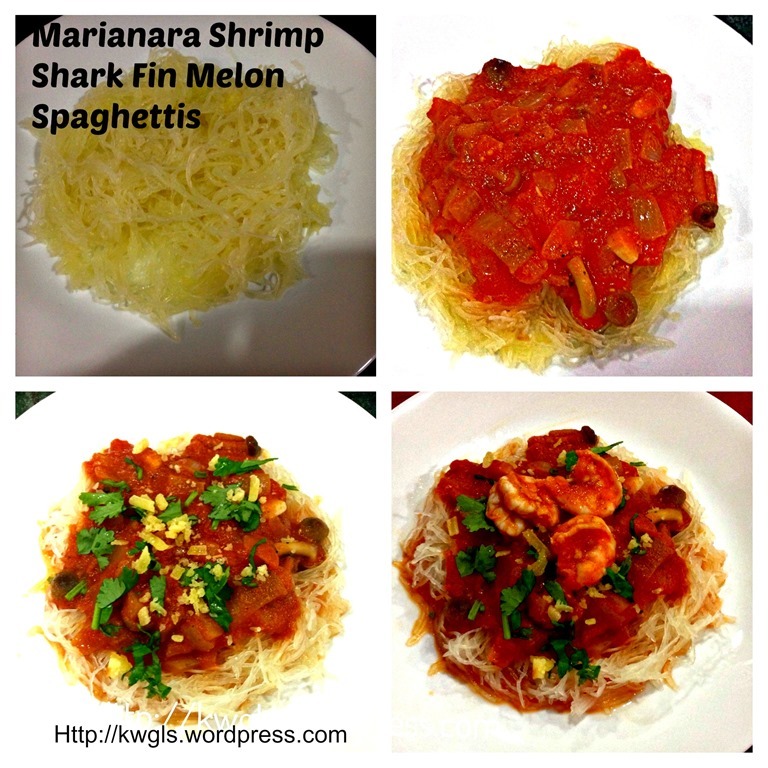 Subsequent read up showed that spaghetti squash and shark fin melon both belong to the same family Cucurbita pepo., however, spaghetti squash belong the species Fastigata whereas shark fin melon belong to the Ficifolia species. 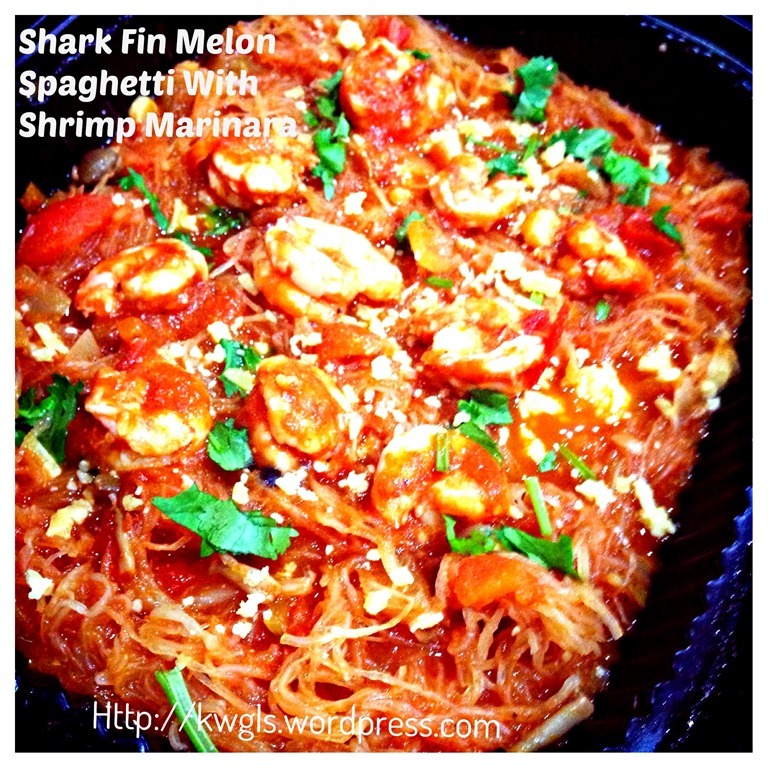 In Chinese cooking, shark fin melons were commonly used to prepare soup. After steaming and de-seeding, the flesh were used to make into some type of starchy soup resembling the real shark fin soup. In fact, it is the alternative of shark fin soup in vegetarian meals. 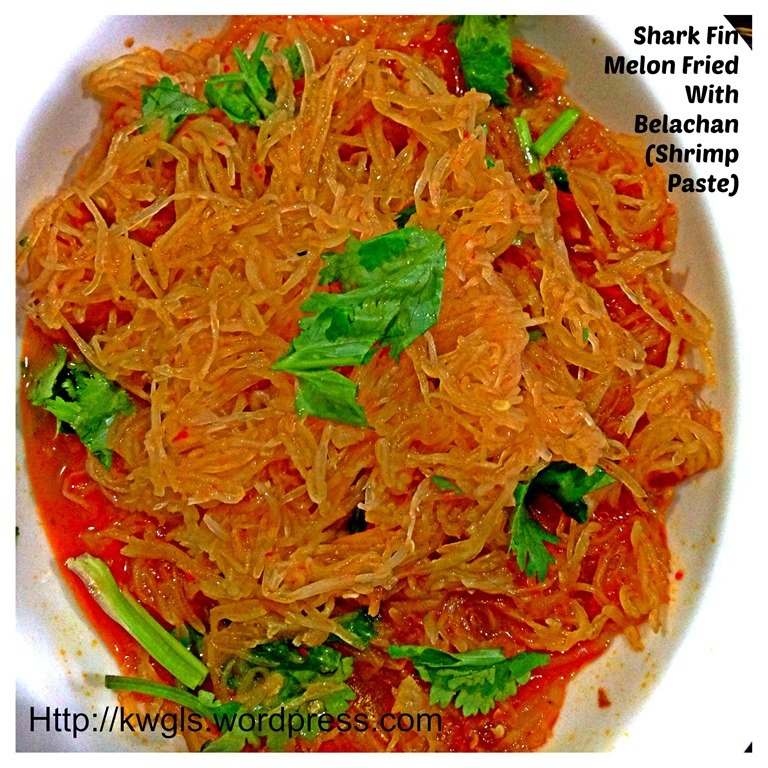 If you are interested, you can refer to Vegetarian Shark Fin Melon Soup (素鱼翅瓜羹）. It was fun to roast the entire melon. It never came across my mind that whole melon “may explode or burst” as questioned by my Facebook friends subsequently. I just roasted the melon in accordance with the instructions. After 45 minutes, the melon was done. I let it cooled and I asked my kids to help me took out the flesh and threw away the seeds. It did took quite a while to do this. After half an hour, I have 1 large container of shark fin melon fleshes. It must be at least 1-1.5 kg of pure fleshes. As I can’t finish it in one meal, I used half for shrimp marinara pasta sauce. On the next day, I stir fried the other half with hot chlli shrimp paste (belachan) to go with white rice. 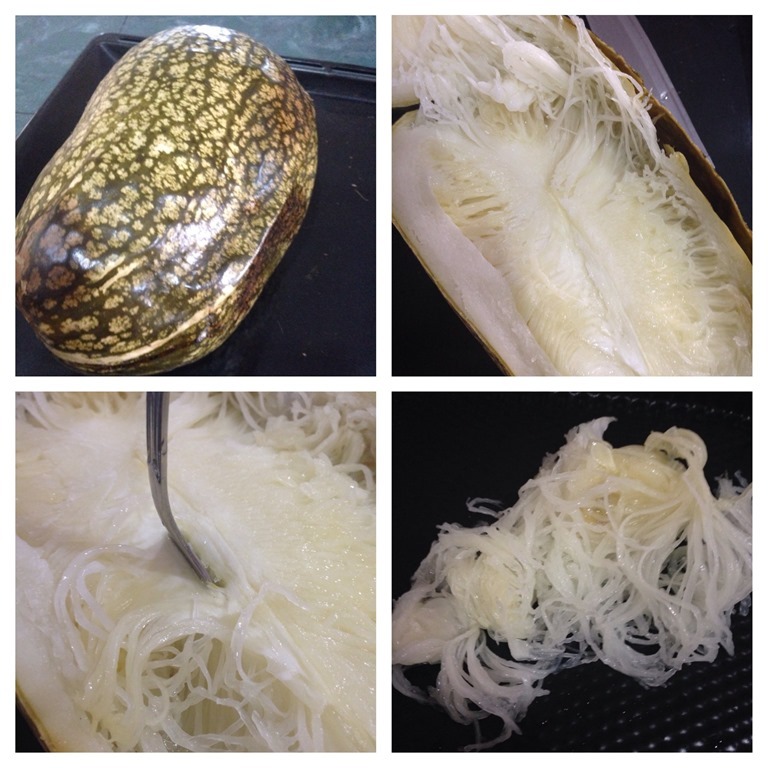 I was rather surprised that the fleshes from roasting and steaming shark fin melon yielded rather different textures and tastes. The fact that it was commonly used in the soup was because when steamed, the flesh was very soft and smooth. On the other hand, when it was roasted, the fleshes were a bit crunchy and sweet.. In the process of de-seeding, my kids kept popping the flesh into their mouth claiming that the unseasoned fleshes were very sweet. In fact, I agreed with them and I am very pleased to have embarked in this adventure. 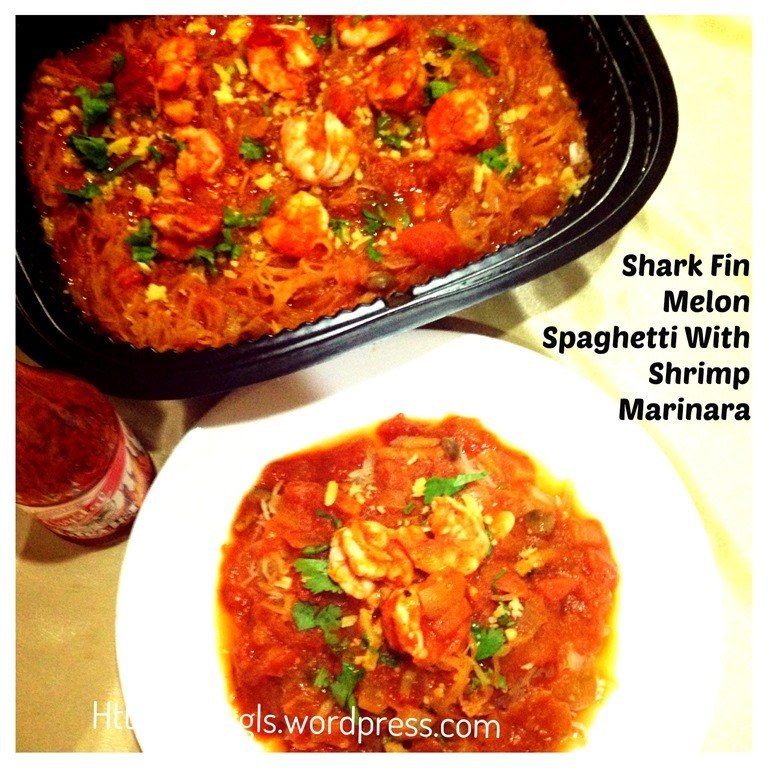 What I am sharing in this post is more of a concept and the recipe is just for your reference and the servings will very much depends on the size of shark fin melon . Dish is full of flexibilities. 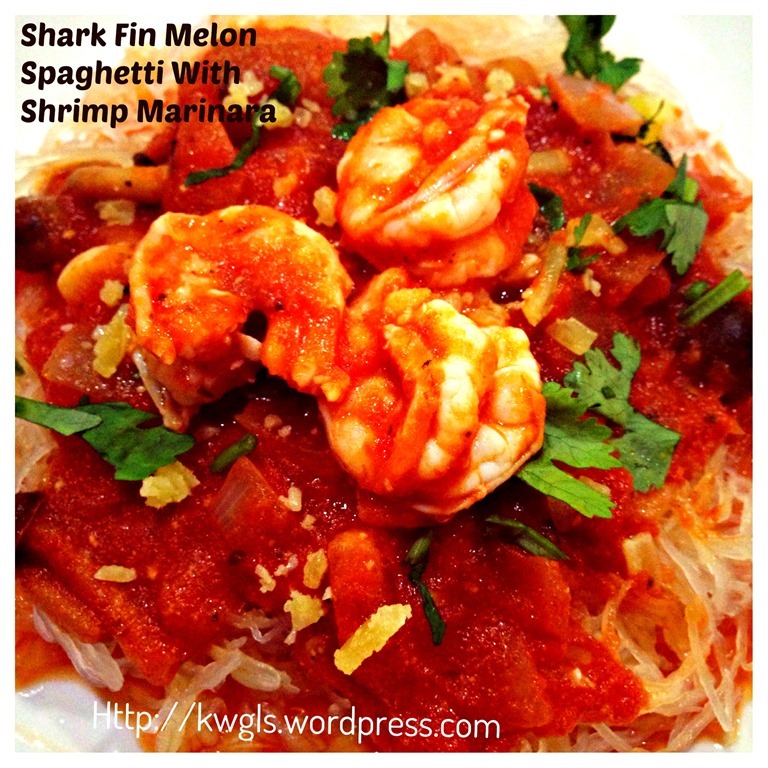 In the very minimal, you will just need a can of pasta sauce, some shrimps and a shark fin melon. Roast the shark fin melon (in whole) at the oven for 180 degree Celsius for 45-60 minutes depending on the size of the melon. Towards to end of the last 15 minutes, you will start to smell the familiar aroma of roasted vegetables. My kids said it smelled like roasted sweet corn. Turn sides after 30 minutes of roasting. 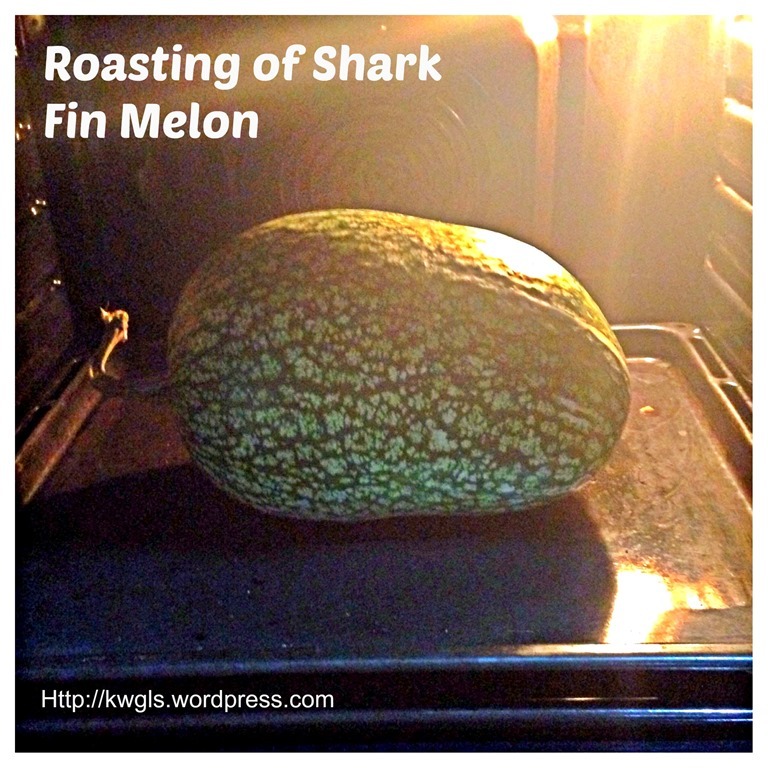 Let the roasted shark fin melon cool to room temperature. Cut the shark fin melon into halves. Use a spoon to dig out the flesh and a fork to take out the seeds. (You can take a few pieces to try the taste, it is sweet and fragrant). The figure above show the seeds, skins and the white membrane that should be thrown away. 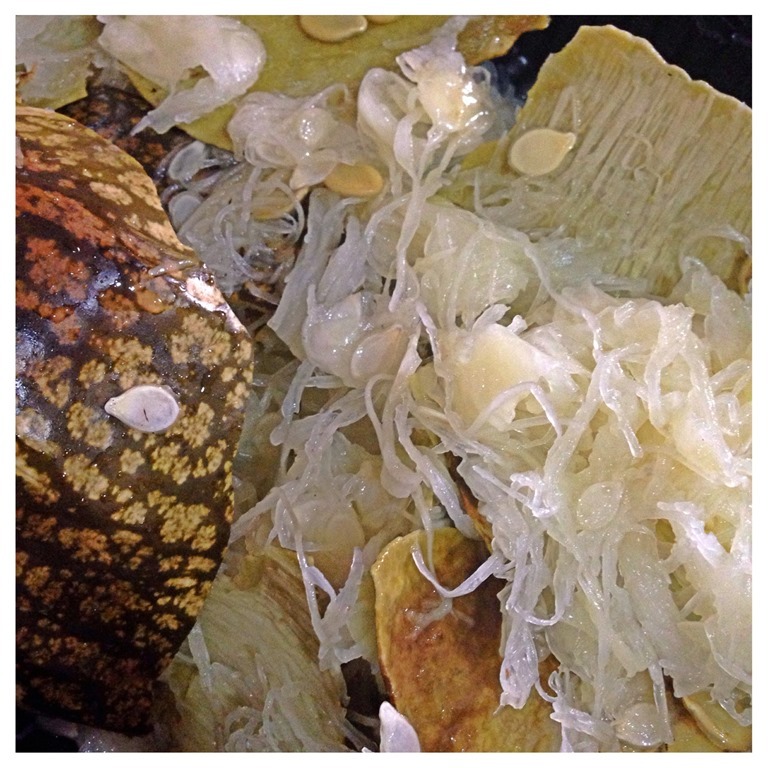 What is left is the white strings of shark fin melon fleshes. 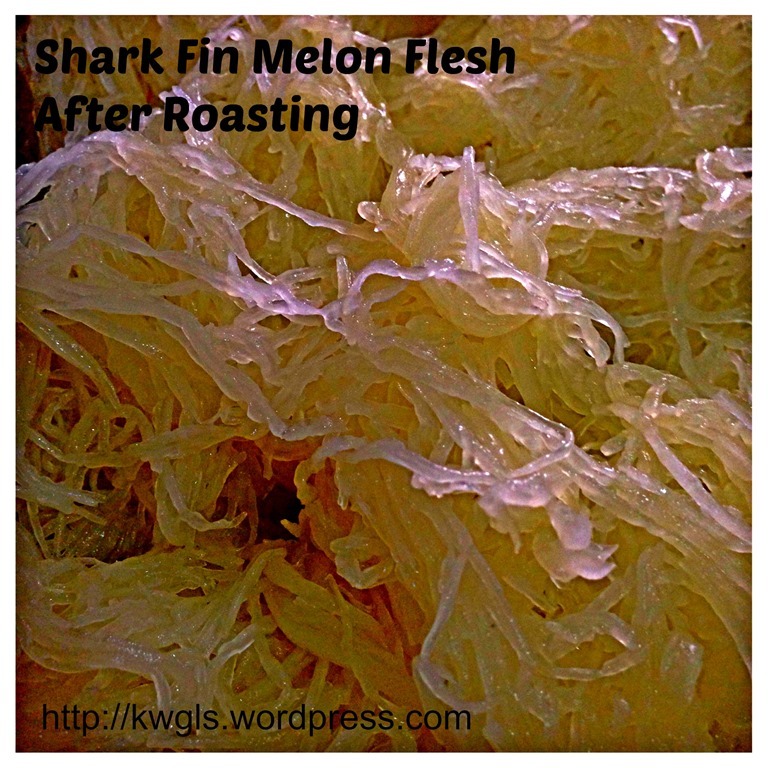 Unlike steamed shark fin melon fleshes that are soft and smooth, these fleshes are rather springy or crunchy. It will be an ideal choice of Chinese style of stir frying vegetables. In a hot sauce pan, sauté the onion and garlic with olive oil until fragrant. 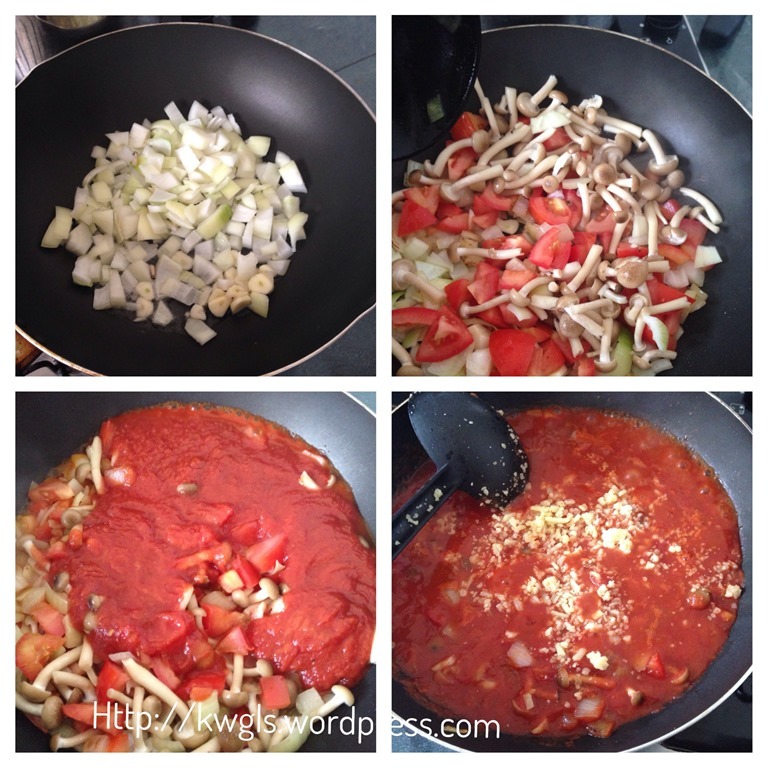 Add in mushrooms and chopped tomatoes and stir fry for 2-3 minutes. Add in canned pasta sauce and let it simmer until all the vegetables are soft. Add some cheddar/parmesan cheeses. Once the cheeses melt, add in the shrimps. 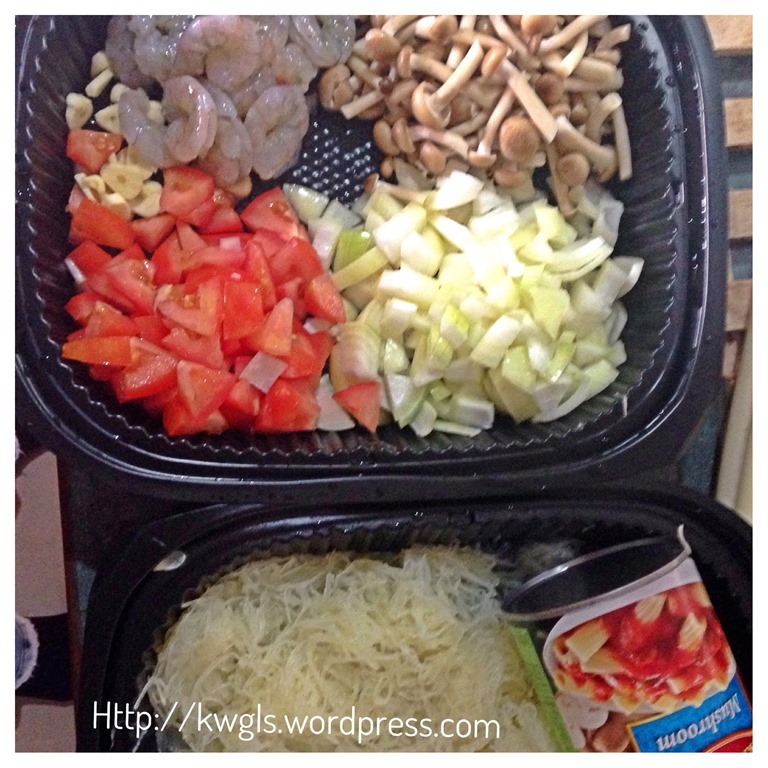 Cook for 1-2 minutes or until the shrimps turn opaque white. Off the heat. 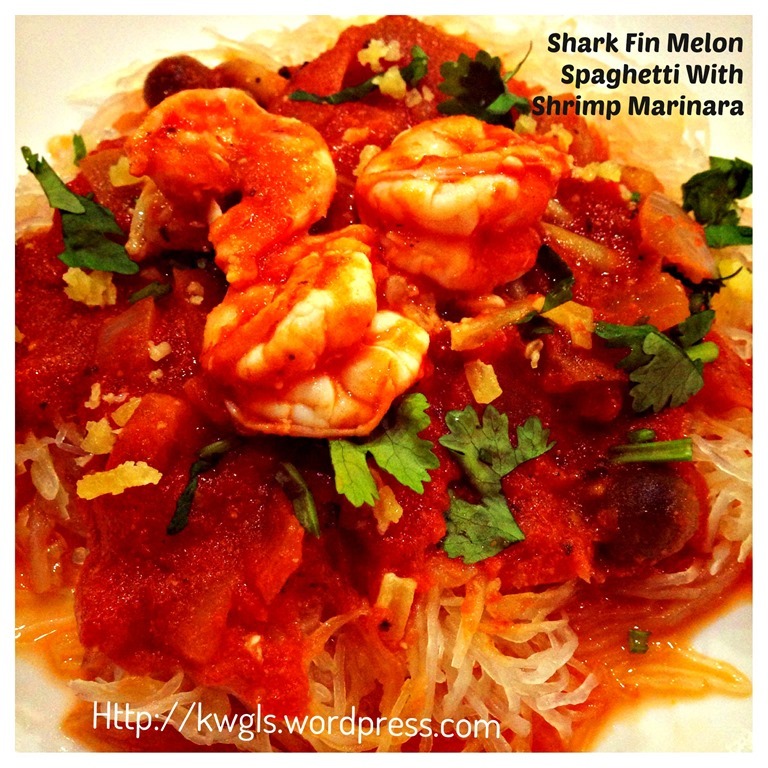 In a serving plate, place some shark fin melon fleshes. 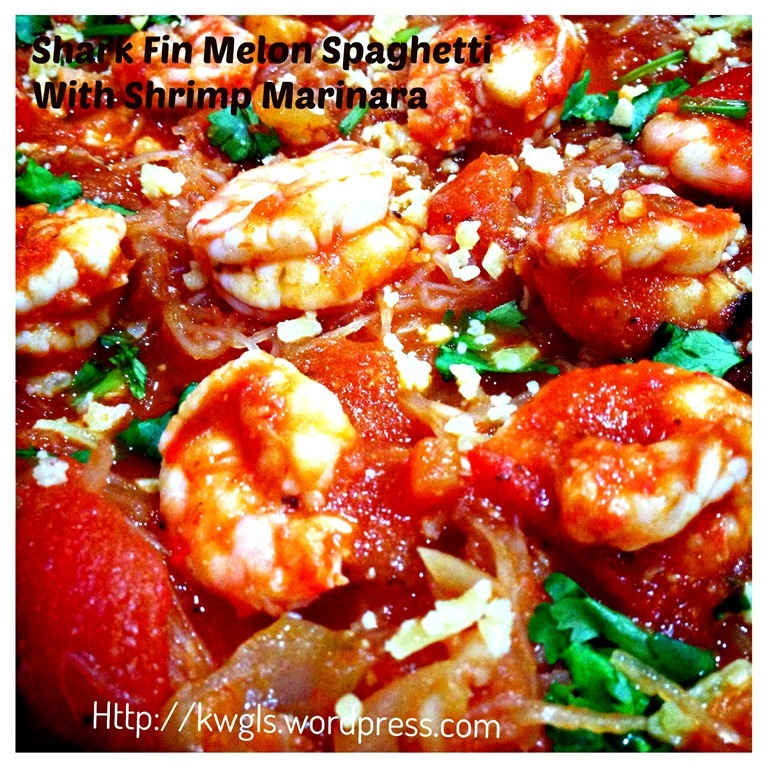 Topped with some pasta sauce and place the shrimps on top of the sauce. Garnish generously with additional cheeses or desired herbs. 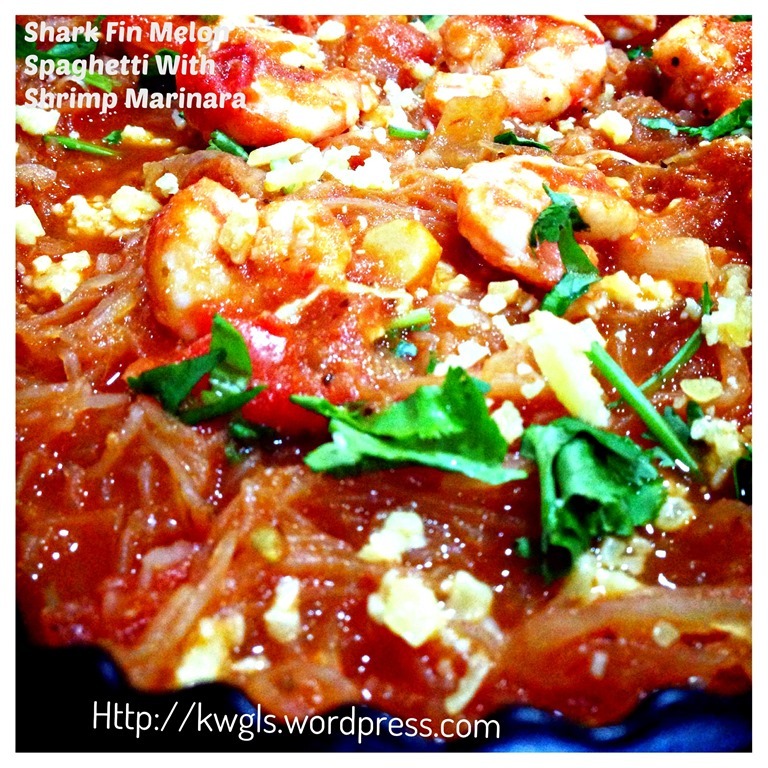 This entry was posted in Food Preparation Series, Western Dish and tagged 8, GUAI SHU SHU, Guaishushu, kenneth goh, postaday, roasting shark fin melon, Shark Fin Melon Spaghetti, shrimp marinara, squash spaghetti with shrimp marinara. Bookmark the permalink. I’m glad this worked out for you! It’s always interesting to me to see all the parallels in different types of cuisine. I’ve never had shark fin melon, but this sounds delicious. Thanks for sharing on Foodie Friends Friday! Intriguing! Never seen shark fin before. Thanks for sharing.